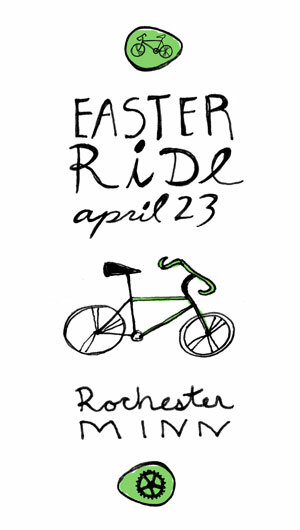 Because of the wonderful work being done by Anna and Ilsa (aka The Planning Committee), we have an Easter Ride for young and old alike (aka bring the kids) to enjoy on Saturday, April 23rd. For the food you can either drop it off at Jeremy’s house that morning or you can bring it to Eric and Anna’s. There will be a car there to transport it to the final location.